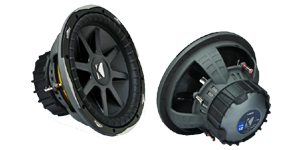 Our Kicker 12" subwoofers can be installed into just about any vehicle or application! We have them available in the Kicker CVT, COMP, CVR, CVX, L5 and L7 series, the woofers work well in either a sealed or vented sub enclosure. We highly recommend paring these model subwoofers with either a Kicker 2 Channel or Class D amplifier.